My wife gave me a wonderful birthday surprise: a two-tier bamboo steamer! 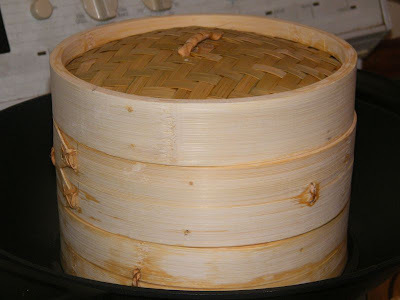 The one with specially-cut bamboo base. I have been asking her if we can buy some bamboo steamers whenever I spot some at the Asian stores but she'd say they're quite expensive. So I was truly delighted to have this! We were, unfortunately, too excited to use the steamers that we skipped on the preliminaries and so our first experience with it wasn't that satisfying. For one, we did not do the preliminary soaking of the bamboo steamers. Just one quick wash and off to the pan. 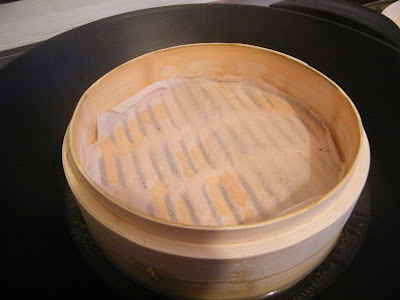 When you have new bamboo steamers, make it a point to submerge these on water for 15-20 minutes, then let steam through it for about half an hour. 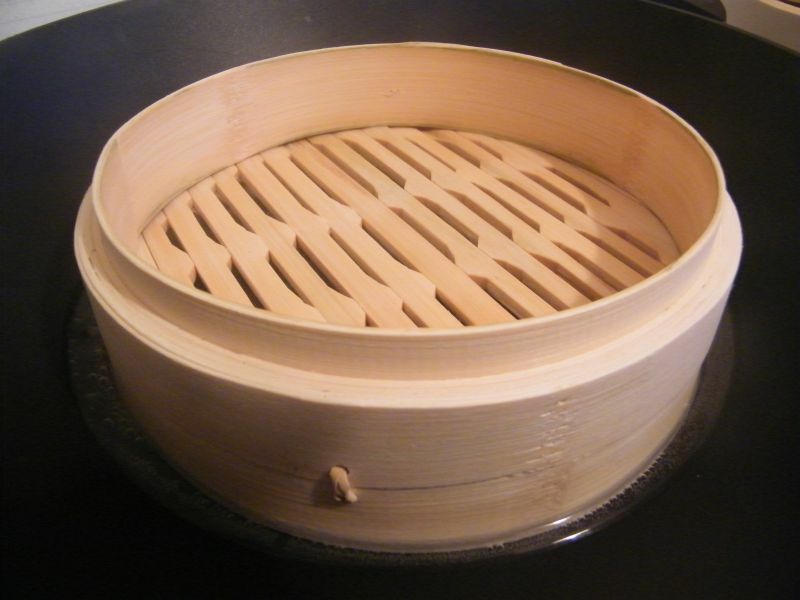 Originally, the bamboo steamers are light brown in colour. The steamer will actually shed off this colour, and transfer to the food! We learned this the hard way. Notice the top photo? We have started steaming food at this point. Notice that the steamers are turning a whitish colour. And where did the brown coloration go? To the food. Secondly: we used an electric wok. Which is essentially a wok that plugs directly to the electrical outlet. I assumed that the sloping bottom will contain water sufficient for the steaming process. But not only was the water quantity not enough, the wok would automatically turn off the heat, then turn back on. This resulted in uneven heating. In the times when the water would stop simmering / boiling, I thought I'd run out of water and so I'd add some more. Only to realize that the wok turned itself off and when it turned up the heat again, the now-excessive water boiled right onto the lower section, drenching the food therein. The next time, I will try using a pot over which the steamer can comfortably sit on so I will have sufficient water simmering away over continuous stove heat. I also learned of a nifty trick: place a coin with the water, which will merrily dance and knock about as long as there's water. No sound, no water. And have hot water on hand for replenishing purposes so the cooking process gets minimal disruption. Third: a couple of times I reached out for the steamers without hand protection. My singed hand from the steam has just healed, but lesson learned: always have oven mittens (and also tongs!) on when dealing with steamed food. At least we got a couple of things right: we placed baking paper on the trays (and punched some holes on it) so that the food will not stick to the steamers, and we thoroughly washed the steamers after use (to get rid of wayward food particles), air-dried it, and stowed it in a humidity-free area. Lessons learned the hard way... surely better results next time!